Springer and I just got back from one of the most beautiful places on the planet – Northern New Mexico – Santa Fe, Taos, Abique, Eagle Nest, Truchas, Madrid and Galisteo. Pictured here is Abique, NM, where Georgia O’Keefe did most of her desert work. The hills, the sky and the life are breathtaking. 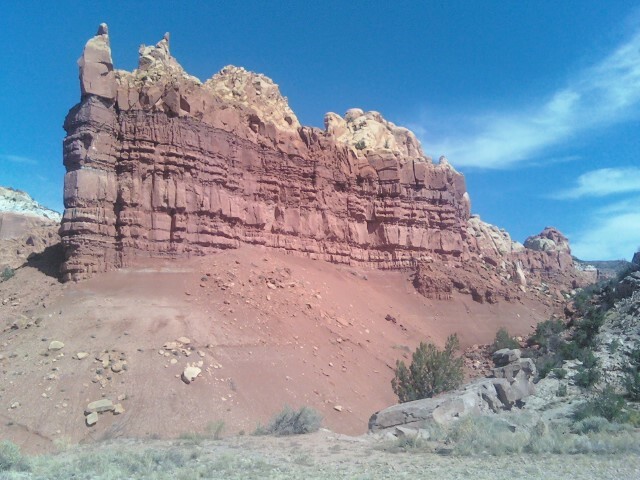 The Presbyterians own Ghost Ranch, her former residence. They conduct a school for art and spirituality which is worth looking into. You can see some of my photographs at the link below. I focused as much on the vegetation as anything else on this trip. It had rained heavily the month dressing the hills in every color. Sailing delayed until first light Friday. Will sleep onboard tonight in port. Tomorrow, my friend Tom Ormbrek and I are sailing an eighty-mile passage from Ilwaco, Washington at the mouth of the Columbia River to Westport, Washington at the mouth of Grays Harbor. We’ll leave at three in the afternoon and arrive at seven in the morning. Or nine, or noon depending on the wind and the seas. We will sail on The Lady Washington, the official ship of the State of Washington. It also happens to be the ship used in The Pirates of the Caribbeanand and many other films. Johnny Depp, Keira Knightley and Orlando Bloom stood upon it many a time. Tom is a good friend and a very astute fellow from a lively, intelligent family. His brother knows everything there is to know about old films. And his other siblings are equally interesting. His niece Layla is a writer. His mother Virginia is wonderful women of about ninety who remembers much more than I’ve forgotten. Tom is a tin bender, as he describes himself. He’s a union man, making his living creating parts for Boeing aircraft. And an expert on Northwest and general American history, Mark Twain, the gold rush, etc. Tom eschews commercial television in favor of PBS and C-SPAN. And he plays a wicked harmonica. I am going to see what life was like on a two-hundred year old ship. The Lady Washington is a replica of one by the same name that sailed the Pacific long ago. I want to sail on the closest thing I can to a real pirate ship as background for a children’s novel I am currently writing. I’ll try to post from the trip, if technology allows.